Founded by John Penney (ex-Ned's Atomic Dustbin), Groundswell delivers crisp, crunchy, and emotionally revealing pop on CORRODE, the band's debut EP. 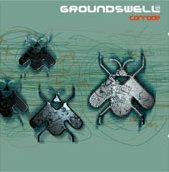 Featuring the self-titled single, as well as a radio mix of the song, and three other blistering cuts, Groundswell promises to be one of the brighter stars in the power-pop of 2000. "Corrode" is a ripping, thumping mixture of razor sharp guitars that orbit the song and hard-hitting rhythm beats (including beefy bass) that push you forward and make you never want to look back. Tight, aggressive, and melodic as they come, the song clearly defines the band as a pop band that can do the job with intensity and melody. Not one to dwell on accomplishments, the band moves forward on "Second Head," a lighter, less aggressive pop song that couples dancing rhythms with warming vocals and sparkling pop hooks. "Find Out Why" cuts right to the heart with its emotional ring and exposed heart lyrics, expressed by slightly-hurting vocals that speak with as much honesty as they do intensity. The versus sooth with a peaceful breeze while the chorus burns with its red hot truths. Then there is "You Think," another track that finds Groundswell blasting out charged power-pop that hooks you from the get go and pushes you out of your seat, calling for a reaction that it most definitely gets. You can't help but move to the ample pop and rock that run through this song. The band captivates with their rocking power-pop. But, they can also appeal to your heart with tender care, as they do on "Find Out Why." The band is diverse enough to keep you interested and craving more with each bite, but solid enough to make you know who you're listening to and why. This is one of the most promising bands in 2000. Keep your eye on them. I know I will. I'll give this an A-.